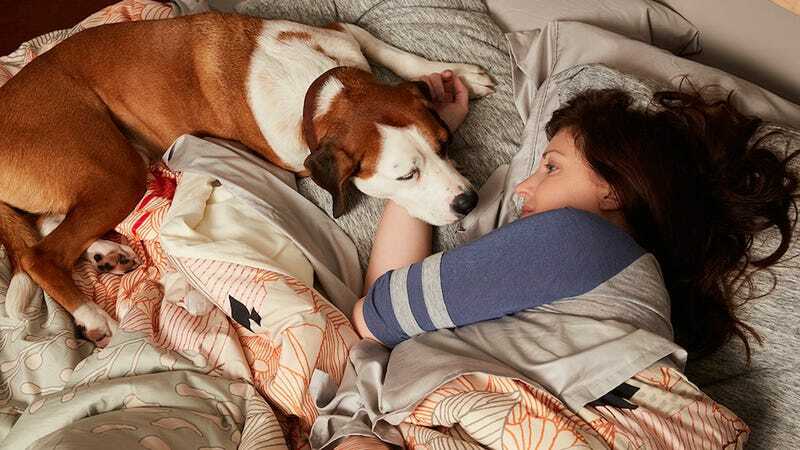 It’s easy to go wrong with a show about a talking dog who’s obsessed with his owner, but somehow ABC’s new summer sitcom Downward Dog—which, told through the narration of a dog named Martin, is about precisely that—might be the sweetest and most tender sitcom to debut in years. The show—which debuted two weeks ago—stars Allison Tolman (Fargo), Lucas Neff (Raising Hope), and an expressive rescue dog whose real name is Ned. Voiced by series creator Samm Hodges (who also made a webseries of the same name), Martin the dog speaks only directly to the audience, allowing us to know his motivations and desires in a way that his owner Nan (Tolman) can only ever guess. His monologues are driven entirely by his canine understanding of relationships: To him, he’s Nan’s entire world, just as she is his—even though her ex boyfriend Jason (Neff) keeps getting in the way. The series, an effort years in the making, was a tough sell to networks and will likely be a tough sell to audiences, particularly for viewers who—unlike me—aren’t immediately inclined to like anything dog-related. But ultimately, or at least in the first couple episodes, Downward Dog transcends the lines of species and becomes, simply and beautifully, a heart-melting show about love and loyalty (be it between Nan and Jason, Nan and herself, or—most importantly—Nan and Martin). Downward Dog airs Tuesdays at 8/7c on ABC.